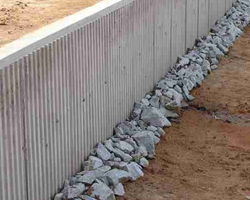 A retaining wall is a structure that holds or retains soil behind it. There are many types of materials that can be used to create retaining walls like concrete blocks, poured concrete, treated timbers, rocks or boulders. Some are easy to use, others have a shorter life span, but all can retain soil. Here at Deon Kapp Construction we can assist you with finding the right solution to your specific needs.